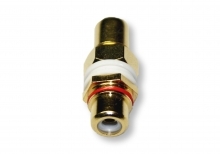 This 24k Gold Plated RCA Wall Plate Coupler (with a red indicator) is hot! RED HOT! Like a super-hot Peruvian Death Pepper chilli! Once it's plugged in, your customised wall plate will be burning with the through-put of super high quality analogue audio! Don't worry though; your wall plate will be insulated from the heat by the durable gold which plates the precisely-fitting screw-on design! Your home theatre setup will then look as tidy as possible, with no unused, empty connectors that could cause an annoying whistle in high winds! This RCA Coupler has a Red Indicator to help colour code your wall plate, and can be used with Component RGB and Composite cables/connectors. Very happy! Easy, safe payment and very quick reliable service - thanks heaps.